When you think of grenades, most people think of handheld explosive devices that are thrown at the enemy position and they explode on target after pulling the pin. There are many types of grenades, grenade launchers, and rocket-propelled grenades that demonstrate the effectiveness of these small explosions for the military as well as law enforcement. Most people have not heard of Thermite grenades, nor do they know that these grenades do not explode but they melt. Not all grenades explode. In fact, the list below are the most common types of grenades and their uses within the military and law enforcement. Though there are many different types of grenades, the one similar feature is that when you pull the pin on a handheld grenade, you have about 4-5 seconds before it explodes or is ignited into chemical reactions or smoke. The type of grenade most people are familiar with is the fragmentation grenades. A wide variety of hand grenades are used today by the U.S. military. Hand grenades are loosely defined as any anti-personnel device that explodes on release. The M67 Fragmentation Hand Grenade is the current fragmentation or “frag” grenade used by American and Canadian soldiers. Below is a list of many of the common types of grenades used by the military, police and special operations teams for a variety of missions. Another very common grenade seen by the public is the tear gas grenade. These chemical grenades are used mainly by police in riot control situations or to end situations where criminals are surrounded and bunkered within a facility. The chemical 2-chlorobenzalmalononitrile is the major component of tear gas – also known as CS gas. It mainly causes visual and breathing irritation causing the eyes to tear and the nasal passages to run uncontrollably. Stun grenades are mainly used by SWAT and Special Operations teams when entering a facility where the known armed enemy is located. There may be a hostage situation where a stun grenade is used to create a loud disorienting explosion with little to no fragmentation occurring. These can be used to create a diversion or upon entry into a dangerous hostage situation. Also known as Flash Bangs or Concussion Grenades. Smoke bombs are another common type of grenade most people have either seen personally or have noticed on television during war or riot footage. The use of smoke grenades is typically used for signaling to another unit your present location or the enemy location for targeting. Smoke grenades can also be used to conceal a group of military members from the enemy force nearby as they find better concealment or retreat. Because of their heat and volatility, thermite grenades are almost never used as an offensive or defensive weapon against people. The weapon is used almost exclusively for destroying enemy materials in a secure and controlled environment. 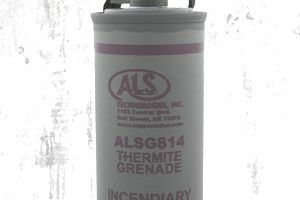 Thermite grenades (designated the M14) are one of the most destructive weapons used by the U.S. military. Thermite is a powerful incendiary device used to produce intense heat through a chemical reaction and destroys anything it touches. Thermite is known as a "pyrotechnic composition" that burns intensely when ignited. When detonated, thermite grenades produce molten iron from a violent reaction of the weapon’s thermite filler. Some thermite grenades have been known to burn at temperatures of nearly 4,000 degrees Fahrenheit. Thermite grenades are capable of burning through an engine block in seconds. Therefore the extreme heat makes thermite grenades is great for destroying enemy weapons/gear caches, bunkers, and vehicles. These are the type of targets that are ideal for use of the thermite grenade. The chemical makeup of Thermite is aluminum powder (metal powder) and a metal oxide (also known as rust). Thermite grenades use iron oxide as an oxidizing agent and they are able to function underwater and can be used by soldiers when their gear is submerged in lakes, rivers, and oceans. The U.S. military provides detailed instructions and training to soldiers on the careful handling and use of thermite grenades to avoid injury or harm to themselves or unit.